The official weigh-in for the latest edition of the Premier Boxing Champions series taking place on Tuesday night in Nice, CA took place earlier today. The official weights for the entire card are as follows. Leduan Barthelemy 129lbs. vs. Reynaldo Blanco 130lbs. Kyrone Davis 153 1/2lbs. vs. Mark Hernandez 153 1/2lbs. Jose Naranjo 123 1/2lbs. vs. Anthony Chavez 123lbs. Eros Correa 122lbs. vs. Damon Simon 121lbs. Alejandro Torres 159 1/2lbs. vs. Malcolm McAllister 158 1/2lbs. Taif Harris 154lbs. vs. Brandyn Lynch 153 1/2lbs. PBC: Barthelemy vs. Blanco takes place tomorrow night (Tuesday, March 28th) at the Robinson Rancheria Resort and Casino in Nice, CA. The card can be seen in the United States on Fox Sports 1 beginning at 9PM ET/6PM PT and will also be streamed on the Fox Sports Go app. For more information about the Premier Boxing Champions series please visit: www.premierboxingchampions.com. For more information about Fox Sports and Fox Sports Go please visit: www.foxsports.com. Check your local listings for time and channel in your area. Check your listings internationally. Boxing as a sport is one that is constantly searching for two components. The next rising star and the sport’s next big “Mega Event.” It should be no secret to longtime readers that one such fighter’s rise that has been chronicled in recent years here at The Boxing Truth® has been the rise of undefeated unified Middleweight world champion Gennady Golovkin. Golovkin has been on what some might call an unprecedented run for a fighter on the elite level of the sport. A run that this observer has called “A Path Of Destruction” through the Middleweight division. Golovkin’s path has seen him compile seventeen successful title defense and twenty-three consecutive knockouts. Along the way, Golovkin has unified four of five world championships in the Middleweight division. In his last fight in September of last year, Golovkin scored a fifth round stoppage of previously undefeated IBF Welterweight world champion Kell Brook. In what could be described as not his most devastating performance, Golovkin was given some difficulty by Brook, who was able to have considerable success in being able to use his hand speed to outwork the champion early in the fight before Golovkin was able to catch up with him in the fifth round and get the victory by Book’s corner throwing in the towel to stop the fight. In covering that fight, this observer stated that even though the fight was not as dramatic in terms of Gennady Golovkin’s ability to bring the fight to a conclusion, he was still able to get the job done and sometimes that is all you can ask of a fighter. It was clear however, that Kell Book was the first fighter to provide the champion with a significant test. Regardless of what one’s opinion might be with regard to Golokin's performance prior to getting the stoppage win over Brook, he was able to pass that test. Now Golovkin prepares to defend his WBA/IBO/IBF/WBC crown for the eighteenth time when he takes on current WBA number one contender Daniel Jacobs on Saturday night at Madison Square Garden in New York City, NY in a bout that will headline a pay-per-view card televised by HBO Pay-Per-View in the United States. Jacobs, a veteran of thirty-three professional fights will enter this fight having scored knockouts in twenty-nine of his thirty two career wins registering a career knockout percentage of 88%. Given Golovkin’s current knockout streak and his own career knockout percentage of 92% having scored knockouts in thirty-three of his thirty-six career wins, it suggests that there may be a likelihood of fireworks from the opening bell. Jacobs, who currently holds interim/regular championship status in the World Boxing Association’s (WBA) Middleweight ratings will be making his second attempt at a world championship. In his first attempt at a world championship in July 2010, Jacobs was stopped in five rounds by Dmitry Pirog in what was at the time a battle for the vacant WBO Middleweight world championship. Jacobs however, has not lost a fight since the encounter with Pirog. The native of Brooklyn, NY known as “The Miracle Man” also overcame a life-threatening illness in 2012 after being diagnosed with Osteosarcoma, a rare form of bone cancer. Given his crowd pleasing style, but more importantly his victory over cancer, Jacobs is likely not to be in awe and/or intimidated by Golovkin. In his last fight, Jacobs scored a dominating seventh round knockout stoppage in his second encounter with former WBC Jr. Middleweight world champion Sergio Mora on September 9th of last year, one day before Golovkin’s successful title defense against Kell Brook. Jacobs has held interim/regular status in the WBA’s Middleweight ratings for over three years and frankly is more than deserving of this title shot having fought and maintained his number one ranking four times since earning the designation with a knockout win over Jarrod Fletcher in August 2014. Although statistics would indicate what some might feel is a strong likelihood of a “Shootout” between Golovkin and Jacobs, it would not surprise this observer if a more tactical battle took place at least early in the fight. Both men know what each other can do and that alone can at times lead to a more cautious approach by both fighters. At the official weigh-in early today in New York City, NY both fighters came in under the 160lb. Middleweight limit. The champion Golovkin came in at 159 1/2lbs. The challenger Jacobs weighed-in at 159 3/4lbs. 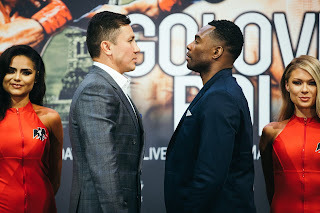 For Gennady Golovkin, if he is successful in this fight against Jacobs, it will put him two successful title defenses away from tying the all-time Middleweight record for successful title defenses currently held by Bernard Hopkins. It will be interesting to see if Golovkin feels pressure not only based on his last performance against Kell Brook, but also the fact that he is gradually inching his way toward Middleweight history to perform well in this fight. For Daniel Jacobs, I feel he must get Gennady Golovkin’s respect from the outset. Golovkin is not only known as a fighter with devastating power, but also as a fighter who relentlessly pressures his opponents and looks to gradually break them down. It will be of equal interest to see if Jacobs perhaps saw something in some of Golovkin’s most recent fights, specifically against Kell Brook that he might be looking to implement into his own fight plan. This fight has all the ingredients of a fight fan’s kind of fight. Two fighters with exciting action-first styles, each fighter with the ability to end the fight with one punch with either hand. When one throws in what is likely to be an electric crowd at Madison Square Garden, this observer believes all the ingredients are present for what may very well be the next “Garden Classic.” A fight that I have very much been looking forward to. We will see who emerges with his hand raised in victory on Saturday night. Golovkin vs. Jacobs takes place tomorrow night (Saturday, March 18th) at Madison Square Garden in New York City, NY. The fight will be broadcast in the United States and Canada on a cable/satellite pay-per-view basis by HBO Pay-Per-View beginning at 9PM ET/6PM PT for $64.95. Contact your cable/satellite provider for ordering information. For more information on HBO Sports and HBO Pay-Per-View please visit: www.hbo.com/boxing. In the United Kingdom and Ireland the bout can be seen on BoxNation beginning at 1AM (Sunday, March 19th, Local UK Time.) For more information about BoxNation please visit: www.boxnation.com. Check your listings internationally. In October 2015 two of Boxing's most feared “Knockout Artists “ Gennady Golovkin and David Lemieux squared off in Madison Square Garden in New York City to further unify the Middleweight division. Golovkin, who entered as the undefeated WBA/IBO world champion facing the IBF world champion Lemieux in what had all the ingredients of a “Shootout!” With both fighters having knockout power in either hand and with each entertaining the fight with career knockout percentages of 91% and 86% respectively, it was certainly not hard to understand how Boxing fans anticipated an all out war between the two. What happened instead however, was more of a demonstration of a fighter showcasing his overall skill set and proving not only superiority of his opponent, but in the process showing the Boxing world that fighters who have carved a reputation as a “Knockout Artist “ can be much more as a fighter than simply one who has devastating punching power. For eight rounds, Gennady Golovkin systematically implemented a strategy using lateral movement, a consistent jab, and effective combination punching to dominate Lemieux. Golovkin scored what some felt was a controversial knockdown of Lemieux in the sixth round of the fight when after nailing Lemieux with a flush left hook to the body, which caused a delayed reaction, Golovkin struck Lemieux, who had taken a knee with a right hand to the head while Lemieux was on the canvas. Although some felt there were grounds for a disqualification against Golovkin, this observer maintains his opinion that the right hand that Golovkin landed was one that was not thrown with the intent of hitting a downed opponent, but was likely caused by the delayed reaction from Lemieux after the previous left hook to the body, which was what caused the knockdown and the decision to not disqualify, penalize, or at minimum warn Golovkin for what should be viewed as an unintentional foul boils down to a referee’s discretion. Despite the element of controversy that arose, Golovkin did not relent in his approach and ultimately was able to stop Lemieux in the eighth round. What should not be overlooked despite the fact that Lemieux came up against a fighter, who on that night proved to have a complete package of skills, was the valiant effort he put forth in defeat. One might argue that Lemieux was also able to provide Golovkin with more resistance than most of his previous opponents up to that point in Golokin’s career. It should also not be overlooked that despite the fight being lopsided in Golokin's favor, Lemieux did have periodic success and landed some flush offense of his own throughput the bout. The logical question that is usually asked of a fighter who suffers the kind of loss Lemieux suffered at the hands of Golovkin is can that fighter bounce back? For Lemieux, the rebuilding process began in May of last year when he scored a fourth round knockout of Glen Tapia. Lemieux followed that victory by scoring a ten round unanimous decision over Cristian Rios in the former world champion’s hometown of Montreal, Canada last October. This led to the third fight on Lemieux’s comeback trail on March 11th against former world title challenger Curtis Stevens at the Turning Stone Resort and Casino in Verona, NY. Much like Lemieux's encounter with Golovkin, this fight pitted two “Knockout Artists” against each other as Stevens entered the bout having scored knockouts in twenty-one of his twenty-nine career wins registering a career knockout percentage of 60%. A commonality that Lemieux and Stevens also shared in addition to their styles in being offense-first fighters was that Stevens also suffered a loss at the hands of Gennady Golovkin, who stopped Stevens in eight rounds in November 2013. Unlike when Lemieux fought Golovkin however, the encounter between Lemieux and Stevens was what most had anticipated, a “Shootout!” For three rounds Lemieux and Stevens engaged in a battle that was fought at a quick pace from the opening bell. It was clear immediately that neither fighter was intimidated and showed no fear for each other’s punching power. With the two fighters exchanging punches and each seemingly looking for the knockout blow, it did not take long for this encounter to live up to its billing. This battle between hard-hitting Middleweights would have an exciting, but brutal conclusion as Lemieux would knock Stevens out cold with a straight right hand to the head followed by a flush left hook to the jaw that sent Stevens down and out for several minutes on the canvas. Stevens left the ring on a stretcher and was taken to a local medical facility for observation. It was reported the day following the fight by several media outlets including Fightnews.com that Stevens was okay and did not suffer a more severe injury due to the knockout he suffered at the hands of Lemieux. This victory for the former world champion Lemieux, the third thus far in his comeback was the type of statement making performance that a rising contender or former world champion seeks as they vie for an opportunity at a world championship. The obvious question coming out of this fight is what are the potential options for Lemieux after scoring what should be considered a Knockout of the Year candidate? Of course, all the attention at least with regard to the immediate future of the 160lb. Middleweight division will be focused on unified WBA/IBO/IBF/WBC Middleweight world champion Gennady Golovkin as he attempts to make the eighteenth defense of his Middleweight crown against current WBA number one contender Daniel Jacobs on Saturday night at Madison Square Garden. It is logical to assume that if the opportunity were to present itself for Lemieux to face the winner that fight that he would certainly consider it. Although Lemieux was bested by Golovkin when they met in the same building where Golovkin and Jacobs will do battle, there have been many times throughout the course of Boxing history where former world champions are open to potential rematches with fighters who defeated them regardless of the competitive nature of those fights. It is important to remember that Lemieux like all of us is human and it is certainly understandable how one might look at his fight with Golovkin as simply a bad night at the office for him. As Lemieux proved in his battle with Curtis Stevens, sometimes all a fighter really needs is one punch. Even though this observer believes that Lemieux could be a viable option for either Golovkin or Jacobs depending on what happens when they meet this weekend, there are other options that could be considered. Options such as a potential challenge of WBO Middleweight world champion Billy Joe Saunders, the only champion in the division that is not named Golovkin. Saunders as some may recall scored a razor thin twelve round majority decision over Andy Lee to win his world championship in December 2015. For the undefeated WBO champion, who scored a twelve round unanimous decision over Artur Akavov in December of last year in his one title defense since his defeat of Lee, could see Lemieux as a potential option to springboard himself into a unification bout with the winner of Golovkin-Jacobs, which would once again fully unify the Middleweight division. If a world championship fight is not in the immediate future however, one potential option that this observer has thought of that I feel could make an interesting fight for Lemieux would be for him to face undefeated contender Rob Brant. Brant, who currently holds the North American Boxing Association (NABA) Middleweight title is unbeaten in twenty-two professional fights and has scored knockouts in fifteen of those twenty-two wins. For Brant a fight with Lemieux would represent an opportunity to climb further up the rankings and if he were to defeat Lemieux, one might assume that Brant, who is currently rated in the top ten of both the World Boxing Association (WBA) as well as the World Boxing Organization (WBO) could himself be in line for a world championship fight. This is of course only three potential scenarios for Lemieux going forward. Although the possibility does exist that Lemieux could take an entirely different route for his next fight, this observer believes one of these three options may indeed be the most logical at this stage of his career. Logic may also suggest that Lemieux’s next course of action would probably be decided after the Golovkin-Jacobs clash takes place on Saturday night. No matter what Lemieux decides to do, he has made a strong case for himself as still being one of the most dangerous fighters in the Middleweight division. Something that any rising contender, world champion, or former world champion should keep in mind as they too discuss their potential options in the future. The official weigh-ins for the highly anticipated Heavyweight showdown between David Haye and Tony Bellew as well as the World Welterweight championship unification bout between undefeated world champions Keith Thurman and Danny Garcia took place on Friday in London, England and Brooklyn, New York respectfully. The official weights for both cards are as follows. Main Event: Heavyweight – 12Rds. David Haye 224 1/2lbs. vs. Tony Bellew 213 1/2lbs. WBC International Welterweight championship – 12Rds. Sam Eggington (Champion) 146 1/2lbs. vs. Paul Malignaggi 146 1/4lbs. WBC Silver Jr. Welterweight championship – 12Rds. Ohara Davies (Champion) 140lbs. vs. Derry Matthews 139 1/4lbs. Jack Sellars 154 1/4lbs. vs. Ted Cheeseman 154 1/2lbs. Katie Taylor 134 1/4lbs. vs. Monica Gentili 134 1/4lbs. Lee Selby 128 1/4lbs. vs. Andoni Gago 128lbs. David Allen 253 1/4lbs. vs. David Howe 251 1/4lbs. Haye vs. Bellew takes place tonight (Saturday March 4th at the 02 Arena in London, England. The card can be seen on pay-per-view in the United Kingdom on Sky Box Office beginning at 6PM (Local UK Time) for €21.95 HD/€16.95 Standard Definition. For ordering information please visit: www.my.sky.com/orderboxoffice/. In the United States, the card can be seen on AWE:A Wealth of Entertainment beginning at 1PM ET/10AM PT. The card will also be available on a pay-per-view basis for non-AWE subscribers on www.KlowdTV.com for $4.99. (Available in the U.S. only) AWE is available on cable providers throughout the United States and on Over The Top (OTT) devices such as Roku and Amazon Fire TV. For more information on availability of AWE on cable or via an OTT device please visit: www.awetv.com. Check your listings internationally. Thurman vs. Garcia: Barclays Center, Brooklyn, NY. Main Event: WBA/WBC World Welterweight Championship Unification Bout – 12Rds. Keith Thurman (WBA World Champion) 146 3/4lbs. vs. Danny Garcia (WBC World Champion) 146 1/2lbs. WBC International Female Featherweight championship – 10Rds. Heather Hardy (Champion) 124 3/4lbs. vs. Edina Kiss 124 1/2lbs. Erickson Lubin 153 3/4lbs. vs. Jorge Cota 153 3/4lbs. Chad Dawson 176lbs. vs. Andrzej Fonfara 176 3/4lbs. Thomas Velasquez 135 1/2lbs. vs. James Lester 137 3/4lbs. Richardson Hitchens 141lbs. vs. Mario Perez 141 1/2lbs. Mario Barrios 139 1/2lbs. vs. Yardley Cruz 139 1/2lbs. Pablo Cruz 125 1/2lbs. vs. Ricky Lopez 125 1/2lbs. Sergey Lipinets 140 3/4lbs. vs. Clearance Booth 140lbs. PBC: Thurman vs. Garcia takes place tonight (Saturday March 4th) at the Barclays Center in Brooklyn, NY. The card, which is being presented by the Premier Boxing Champions series can be seen in the United States on CBS beginning at 9PM ET/6PM PT. Check your local listings for time and channel in your area. For more information about the Premier Boxing Champions series please visit: www.premierboxingchampions.com. For more information about CBS and where to find it in your area please visit: www.cbs.com. In the United Kingdom and Ireland, the card can be seen on BoxNation beginning at 2AM (Sunday, March 5th Local UK Time.) For more information about BoxNation including schedules and channel listings in the UK please visit: www.BoxNation,com. Check your listings internationally.